I’m oodles of days overdue in contributing to the annual Day of Archaeology (11 July 2014). The delay relates in part to what I’ll discuss below – The Heritage Jam – and in part to the fact that I’m simultaneously prepping to leave for fieldwork at Çatalhöyük on Sunday, finishing multiple articles and reports, and preparing for the adventure that will be the next five months of my life, wherein I’ll be abroad for my sabbatical (more on that another time!). But being late in writing this post has given me a bit of time to reflect—and most importantly, to collate reports from others—on the event that consumed my Day of Archaeology, not to mention all of the days leading up to it, and all of the days immediately after. On 11 July 2014, supported by the Department of Archaeology at the University of York, and the Centre for Digital Heritage, we hosted the first ever international Heritage Jam. The Jam was a variation on the jamming sessions common in the gaming industry, where adhoc groups congregate for intensive periods of time to produce game prototypes. But instead of games, we were keen to put a spotlight on the many different media that comprise the portfolio of heritage interpretation – from illustration and art to moving-imagery and animation to photography and design to sound and tactile interventions. And instead of live in-person sessions only, we were keen to open up participation to both remote and local registrants, weaving together the online and offline worlds. The Heritage Jam ultimately coalesced into a multi-part project, all of which is documented on our website, blog, Twitter and Facebook pages. The goal was for individuals or groups to create some kind of visual output (whose process of creation was also documented in a paradata paper) for upload to our online gallery and for physical display at the University of York. The entries were judged on a series of assessment criteria, and had to attend, in some fashion, to the theme of burial (literal or metaphorical, of humans or non-humans). For in-person contributors, we decided to focus the Jam Day efforts on a particular case study site—the York Cemetery—which was necessary to provide some focus to what was an otherwise vague directive (i.e., “work with an assigned group to make new interpretative materials”). And our team created a series of multi-media resources to support understanding of that site, including videos, photos and compilations of archival records. By my reckoning, the day was a success, attested to not only by the phenomenal outputs submitted by an incredible range of contributors, but also by the feedback we’ve received from those involved and those who’ve viewed the gallery, some of whom have documented the constructiveness of the approach & its outputs on their personal blogs & Day of Archaeology posts (see links below). Coupled with a specific social media use/evaluation plan that we’ve designed for the Jam, we’re analysing experiences and engagement with the project for a larger report that we’ll file at the end of the month. But the superficial numbers (which will soon be blended with qualitative data to provide a rich, contextualised understanding of participation) indicate that we had 92 registrants from most continents of the world, 17 official entries submitted by 37 contributors, 249 Twitter followers & 161 tweets, and 474 Facebook followers from more than 40 countries, speaking more than 30 languages, with a total reach of posts to over 6600 people. Given that we only launched the project in May, we’re pleased with the visibility it’s received—but more so with the quality of the entries, which are truly fantastic. This is exactly what Voices Recognition achieves in its prototype form, put together after a 30 minute trip to the York Cemetery and about 10 hours of intensive group work in a classroom at the university. I have to admit that when the group presented their output at the end of the day, I was truly awestruck, so much so that it rendered me quite emotional. For it was a glimpse into what great things can be accomplished when you’re able to nurture the right context: an incredible idea (tested out previously with Graham) comes together with an incredible team of people (some of whom were strangers to one another), all converging here into something with a real and profound power to resonate. As I said to Morgan after the event, it was inspirational – and it really was; it made you want to learn how to do such work; it made you want to use the app; it made you want to join their team, and create with them, and be energised and motivated by their ideas, and to experience the cemetery through this lens that they invented right there, in the moment, on the Day of Archaeology. These entries are just two of 17 that deserve your attention and perusal, so please browse through the gallery, and add your comments to the site or to our Twitter or Facebook feeds. There are contributions from around the world, articulated via a plethora of media, submitted by both new and established practitioners. I won’t pretend that all the comments we got about the Jam were positive (although the vast majority were), nor that there’s no room for improvement. It was a massive amount of work; it depended on a team of 11 organisers; it required openness to creating things quickly, which means making mistakes and wrestling with practicalities and exposing one’s process, and hence one’s potential vulnerabilities and weaknesses; it demanded doing just as must as intellectualising, which can be problematic given how theoretical much extant ‘archaeological representation’ discourse is; and the in-person event hinged upon teamwork, which as any educator will tell you, can go horribly wrong—but, in the best cases, can equally blow you away in admiration. In our effort to provide some definition to the exercise of heritage jamming, we did consciously choose to focus on a particular site – the York Cemetery – and this caused some concern around why we were privileging that environment. But archaeology has these tangible dimensions to it, and as much as we wanted to leave the Jam brief entirely open, we also wanted to create a project that knitted the material and the immaterial, the online and the offline, the tangible and the intangible, the process of abstract thinking with the real-world, concrete act of making. To have eliminated the cemetery would have returned the event to the intellectual exercise that the subject of ‘visualisation in archaeology’ has long been. Moreover, to have deprived Jammers of the opportunity to visit the cemetery would have meant depriving them of a series of experiences—from the reflectivity that’s encouraged through walking, to the camaraderie and knowledge that are built through shared embodied engagements with a physical landscape. 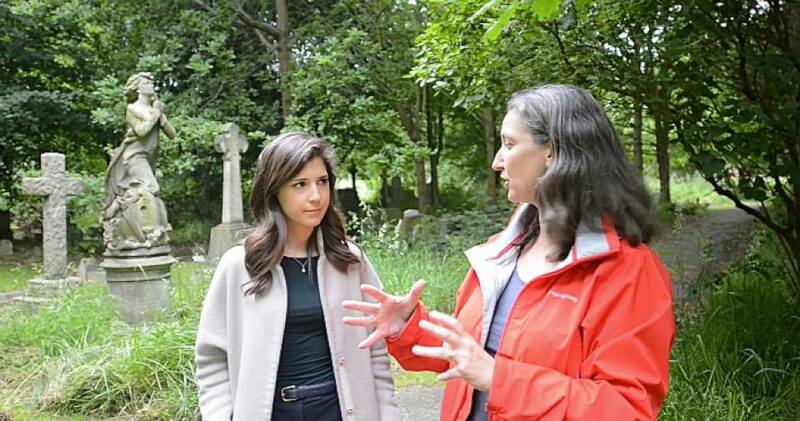 In her blog post about the Jam, Holly Wright of the Archaeology Data Service, speaks about of the nature of the cemetery, a breathtaking and deeply reverberating space which is barely known in the York community (despite the fact that it houses the history of much of that community). There is value cultivated for heritage spaces through both our analogue and digital—and our physical and intellectual—engagements with them. The cemetery provided us with a site to experiment with the weaving together of it all. I’m proud of what we achieved through the Heritage Jam and I would encourage others to consider this format for their own work, particularly if you’re directing the outputs into larger, targeted, useable resources. The fleeting composition of the Jam belies a venture with a longevity to it that extends beyond the Day of Archaeology, so I hope you’ll keep your eyes on the project to see how it develops from here.